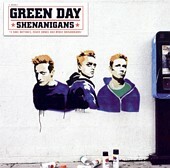 With fourteen rare outtakes, cover songs, and b-sides from multi-platinum selling pop-punk outfit Green Day, Shenanigans represents the punk side of things for Green Day, as they bash them out, fast, snotty, and loaded with melody. This is the band that first made their way onto radio in 1995 with several singles off of Dookie. Longtime fans that have since abandoned Green Day because they're too commercial (aka 'they sold out'), or because you just don't like their new stuff, take notice. Shenanigans is what you want, what you need to restore your faith in the reigning kings of catchy-as-hell, solid pop-punk. This is a breath of fresh air from Green Day's weaker new stuff. It draws a map of where Green Day has been while showing where they went and where they're going. Now, blast it and sing along. I'll give it a B+.